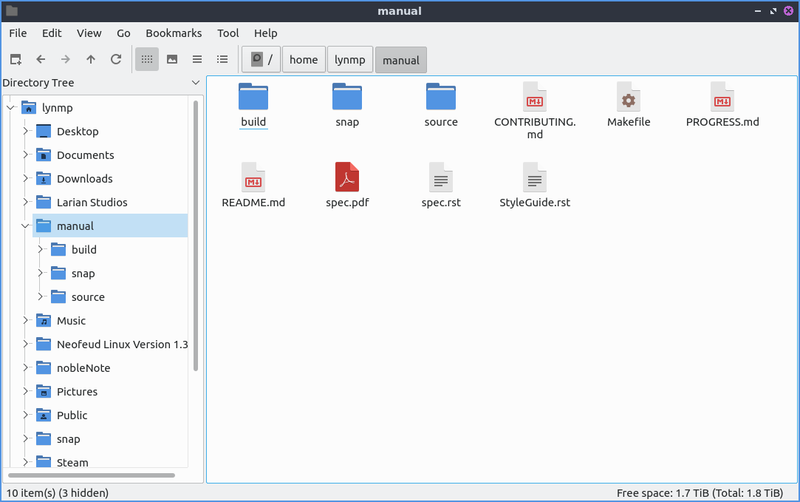 PCManFM-Qt (PCMan File Manager) is a file manager application ported to Qt after the original developed by Hong Jen Yee from Taiwan which is meant to be a replacement for Nautilus, Konqueror and Thunar. Ability to eject removable media and the ability to mount other filesystesms internally. Along the top to create a new tab in pcmanfm-qt you can use the button with a file and a plus on it to open a new tab or press control +t. The left pointing arrow button is a back button while the right pointing arrow button moves you forward in the directories that you have moved in the file manager. Another way to go back and forward is Alt + Left arrow or Go ‣ Go Back and another way to go forward is Alt + Right Arrow or Go ‣ Go Forward. The button for the arrow pointing upward is to go up one level in the directory tree to the so called parent directory. To rename your files right click on the file and click rename or press f2. To close a tab click on the red x button on the tab bar. To close a tab using the keyboard press Control +W or from the menu File ‣ Close Tab. To close all tabs but the current one right click on the tab bar and Close other tabs. To close all tabs to the right of this tab Close next tabs. To close tabs to the left right click on the tab bar and select Close previous tabs. To create a new empty text file press Control + Alt +N or File ‣ Create New ‣ Blank File and type in the name of the file you want. To create a new folder or directory press File ‣ Create New ‣ Folder or press Control+ Shift +N and input the new folder name. To delete your files from pcmanfm-qt will first put them in the trash so they are not gone forever. To move a file into the trash right click that file move to trash or press Delete. To get a file out of the trash in places trash to get to your trash or Go ‣ Trash. To bring a file back from the trash right click Restore. To permanently delete all files from the trash can right click on Trash in the places sidebar Empty Trash. To go back to your home folder press Alt +Home or Go ‣ Home. To view a directory tree on your side pane select Directory tree from the menu above the side pane. To expand into a folder press the + to expand the files and the - button to collapse the folder. To switch to a folder left click on the folder name. To have open a directory in a new tab right click on it and select Open in new tab. Top open a folder from the directory tree in a terminal Open in terminal. To switch to back to places from the menu above the side pane select Places. To toggle having a split view to be able to view two folders in press F6 or View ‣ Split View. 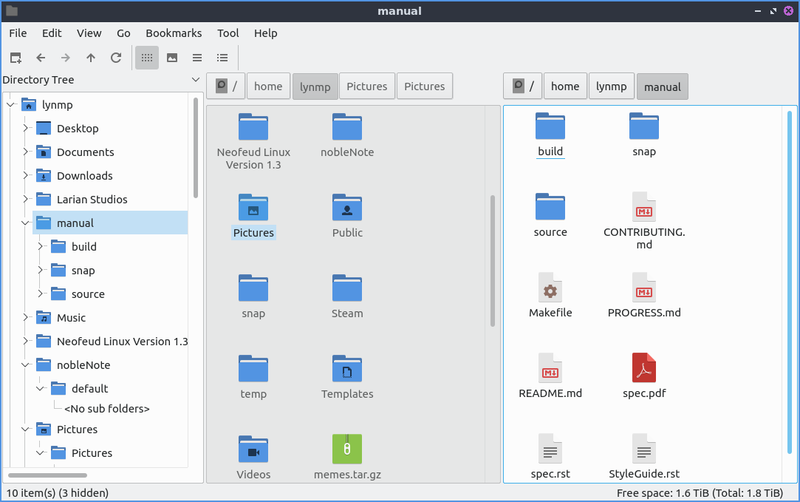 This split view allows you to have two folders open which is quite useful for copying files. To switch between the two different folders left click on the half of the screen to move to the left hand side to manage files and click on the right hand side to manage files on the right on side. If you single click on a file you will select it. If you double click on it you will open it in the default program to open that file. If you right click on a file you can select which program to open a file with if you have multiple programs to open it. If you want to select multiple files you can hold down control+ Left click to select each file. To copy files select the file right click Copy, Edit ‣ Copy, or press control +c. To cut files select them right click Cut, Edit ‣ Cut, or press control + x. After copying or cutting a file you can paste them with right click Paste, Edit ‣ Paste, or press control +v. To select all files in a directory is to press Control+ A or right click Select All for all of the files. To select multiple files with the mouse you can hold down Control and left click to select all of the files. To bulk rename multiple files first select all the files you want to rename then Edit ‣ Bulk Rename. To connect to a remote server such as a NAS go to the Go ‣ Connect to server and authenticate to your remote storage. If you want to plug in removeable storage you can open the storage on the left sidebar with devices. To switch to the removable media left click on the device in the side pane. This same applies to other internal filesystems on your computer. To eject removable media press the button on the left with a circled up arrow to eject. On the side pane you can right click to open a place in a new tab by right clicking Open in new tab for places and mounted drives. If you want to return to your home folder Go ‣ Home or press Alt + Home. pcmanfm-qt also supports transferring files to mobile devices plugged in with a usb cable. On the left hand side under devices the mobile device will appear. You may need on your device to allow it to transfer files. After you have done this You can see the files on mobile device and transfer files to them. To eject the mobile devices press the upward pointing arrow to unmount it. At the bottom of the window is a filter bar that lets you show files only matching a pattern in the window of the current folder. To use it type what you want to search for in the bar that says Filter. How many result you match will show in the item(s) field. To return the filter back to seeing all files clear the text field by pressing Control + K, or holding the backspace key to clear it out. On the very bottom of the pcmanfm-qt window when you have nothing selected it shows X item(s) (y hidden) showing how many items are in the current folder. To the right of this shows Free space showing how much free space you have. The (Total) shows the full size of the storage medium this is on. When you select one file on this bottom bar it will show the file name you have selected and the type of file it is. If you select multiple files the bottom bar to the left will show X item(s) selected where X is the number of files you have selected and how much disk space they take up. To see hidden files press control +h, right click show hidden, or go to:menuselection: View –> Show hidden . Press the same thing again to hide hidden files again. To open a terminal in your current folder press f4 or Tool ‣ Open Terminal from the menu. To view the properties of a file or folder right click on it and select properties from the menu, File ‣ File Properties or press Alt +Enter. To view a dialog that shows folder properties File ‣ Folder Properties. The General tab will show you the size of the file, where the file is, and when it was last modified or accessed. The Permissions tab will show you who owns the file which if you can’t change it will be grayed out and who has permisson to read modify and execute the file. To change permision of files the Owner, Group, or Other drop down menu will allow you to choose whether you can read, read and write, or forbidden. To make something executeable such as a script you wrote check the Make the file executable. At the bottom of the window is a bar graph showing disk usage of the storage device the file exists on. Pcmanfm-qt can actually launch other applications in places Applications or Go ‣ Applications and then gets all the tasks in the menu in lxqt-panel. 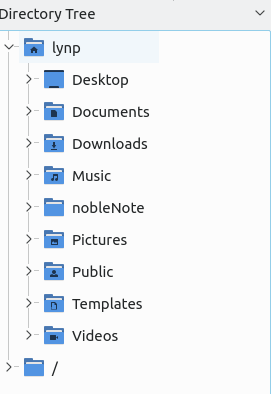 To view what files are on your desktop Go ‣ Desktop or on the places sidebar press the desktop item on the left. To add a bookmark Bookmarks ‣ Add to Bookmarks and it will make a bookmark. To later access this bookmark it will be on the left hand side under bookmarks and under the bookmarks menu. To bring up a dialog to edit bookmarks Bookmarks ‣ Edit bookmarks. To Remove a bookmark from the edit bookmarks dialog press the Remove Item button. You can also add a bookmark from here with the Add item button. To cancel your changes press the Cancel button. If you want to run an executeable script from pcmanfm double click and then click Execute on the execute file dialog window. If you wish to edit the script you can press the Open button. To cancel and not do anything press the Cancel button. Pcmanfm-Qt has different view modes which can be changed in the view menu. To select a view that has bigger thumbnails to view pictures before deciding to open them View ‣ View ‣ Thumbnail View. If you want to view lists of move data about something like the file size the time it is modified select detailed list view by View ‣ View ‣ Detailed list view. If you really want to have see as many files in a small area use the compact view or View ‣ View ‣ Compact View. To return to the original view of pcmanfm-qt is to View ‣ View ‣ Icon View. To reverse the order that pcmanfm-Qt sorts files View ‣ Sorting ‣ Descending or conversly to switch back View ‣ Sorting ‣Ascending. To sort by file name View ‣ Sorting ‣ By file name. To sort by modification View ‣ Sorting ‣ By modification time. To sort by file size View ‣ Sorting ‣ By file size. To sort by file type View ‣ Sorting ‣ By file type. To sort by owner View ‣ Sorting ‣ By Owner. To seperate all folders first in sorting check the checkbox in View ‣ Sorting ‣ Folder First. To sort with case sensitive check the checkbox in View ‣ Sorting ‣ Case sensitive. To change your path bar to buttons View ‣ Pathbar ‣ Location and to get back to a pathbar you can type into View ‣ Pathbar ‣ Path Buttons. To toggle showing the menubar Control +M or View ‣ Toolbars ‣ Menubar and uncheck the checkbox. To get the menubar back press Control +M again. To toggle showing or hiding the permanant filter bar press Control+B or View ‣ Toolbars ‣ Permanent filter bar. 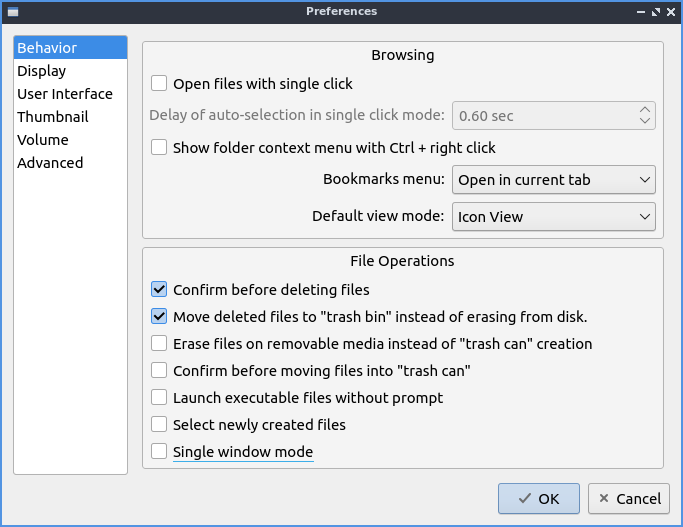 pcmanfm-qt has options when right clicking has special options for dealing with archives such as tar or zip files. To extract the files in the current directory right click and select extract here. You can also extract to another location with right clicking and selecting extract to and a dialog will pop up showing to where to extract the file. To search for files press f3 or Tool ‣ find files for files. To type part of name in the part where it says File Name Patterns. To make your search case insensitive check the Case insensitive. To toggle searching with regular expressions check/uncheck the Use regular expression checkbox. To add locations and places to search press the Add button and select the additional places to search. To remove an additional place to search press the Remove button. To toggle searching in Subdirectories check/uncheck the Search in subdirectories. To toggle searching for hidden files check/uncheck the Search for hidden files. To change what types of files you use choose the File Type tab. To choose to search for only certain file check/uncheck the files under the text Only search for files of following types: text. The options for which type of file include: Text files, Image files, Audio files, Video files, Documents, or Folders. The Properties tab has more settings based on information about the file also called metadata. To only show results on files larger than this file check the Larger than checkbox and then in the field to the right for size. To only show files smaller than this check the Smaller than checkbox and to the field to the right select the size smaller than that. To search for files modified before a date check the Earlier than checkbox and select the date to the right. To search for a file modified after a date check the Later than checkbox and input the date to the right. To open a dialog for preferences of pcmanfm-qt Edit ‣ Prefrences. The Behavior tab has settings for the way pcmanfm-qt manages files. The checkbox Open files with single click opens files by clicking on them once and you select the files by mousing over them. The Bookmarks drop down menu has options to either open bookmarks in the current tab, open bookmarks in a new tab, or open bookmarks in a new window. The Confirm before deleting files checkbox makes a confirm dialog before deleting files. The checkbox Move deleted files to “trash bin” instead of erasing from disk puts files in the trash bin instead of always deleting them. The Erase files on removable media instead of “trash can” creation erases files on removable media isntead of creating a trash can on the removable media. The checkbox Confirm before moving files into “trash can” brings a confirmation dialog before moving files to the trash can. The checkbox Launch executable files without prompt will run executable files without bringing up a prompt asking what to do with the file however you will need to restart pcmanfm-qt for this to take effect. To select new files automatically check the Select newly created files checkbox. The tab Display tab allows you to change icon sizes and changes size preferxes hide backup files and settings for margins. The Size of big icons changes the size of big icons in pcmanfm-qt. The Size of small icons Changes the size of small icons for pcmanfm-qt. The Size of thumbnails changes the size of thumbnails in pcmanfm-qt. The Size of side pane icons changes the size of side pane icons. The checkbox Use SI decimal prefixes instead of IEC binary prefixes treats kilobytes, megabytes, and gigabytes as base 1000 instead of 1024. To toggle showing backup files as hidden check/uncheck the Treat backup files as hidden checkbox. To change the minimum margins in icon view for number of pisels change the numbers in Minimum item margins in icon view. To toggle locking the marings in places check/uncheck the Lock checkbox. The tab User Interface changes how pcmanfm-qt appears in windows. To toggle always showing the tabbar even when you have only one tab check/uncheck the Always show the tab bar checkbox. The checkbox Fullwidth tab bar makes the tab bar take the full width of the window including over the side pane. To toggle showing the x on each tab to close each tab check/uncheck the Show ‘Close’ buttons on tabs checkbox. To have pcmanfm-qt open the window in the same size as the last time you closed the window by checking/unchecking the Remember the size of the last closed window checkbox. If you have the Remember the size of the last closed window you can change the Default width of new Window filed or Default height of new windows fields. The tab Thumbnail tab has settings for thumbnails on files in pcmanfm-qt. To enable/disable thumbnails check/uncheck the Show thumbnails of files checkbox. If you want to only have thumbnails for local files not on another machine check Only show thumbnails for local files checkbox. Unchecking the previous checkbox will result in a slower performance to get the thumbnails for the files. To put an upper limit on the file size for generating thumbnails which makes thumbnails change the Do not generate thumbnails for image files execeeding the size field. The tab Volume manages flash drives other partitions on external disks and other external media. The Auto Mount section is settings for atuomaticaly mounting removable media. The Mount mountable volumens automatically on program startup mounts removable media when you start pcmanfm-qt. To automount removeable media when you insert them into your computer check the Mount removeable media automatically when they are inserted. To show a menu for removable media when inserted check/uncheck the Show available options for removable media when they are inserted. To choose when you unmount a removable volume you can choose to Close tab containing removeable medium or Change folder in the tab to home folder. The Advanced tab shows integration with other programs and advanced settings. To change your default terminal emulator from pcmanfm-qt preferences drop down change the Terminal emulator drop down menu. To change your Archiver integration change the Archiver integration drop down. Lubuntu currently ships with 0.14.1 of pcmfanfm-qt. Feel free to append [lxqt-sudo] to run PCManFM-Qt as root. You can also go to the Applications menu Accessories ‣ PCManFM-Qt File Manager. There also is a keyboard shortcut for launching pcmanfm-qt of Super + E. The icon for pcmanfm-qt looks like a file cabinet drawer with files in it at the top.